The bezel holding on the glass is crimped on, I have tried to remove these, without the proper tool its not easy, and you will probably distort it a little but it is possible, gently work round the seam with a fine blade , once you get a gap use a thicker blade. The seam is hidden by the mounting rubber, so you can get away with some collateral damage and hide your shame. A decent glass shop could cut you a new piece using the old bits as a pattern. There are folks out there , Nissonger I think in the states ,who can refurb these, check the price first. Thanks for billet offer. The 4 :1 tachs are probably triumph types. Yes and yes, however you can buy a kit consisting of a glass with a new bezel + necessary seals which are mostly gone in these old instruments. Not from Walridge, because his kit has a bezel too short. 3:1 speedos show up regularly on american eBay, but I'd buy a copy for $70 which is longer but fits your 71 rubber covers. Their reliability is good and it's hit or miss with old original. Last edited by Adam M.; 02/06/19 3:43 pm. I've rebuilt a couple of Smiths speedos using info from a book by author Graham Blighe see This Link, results were ok but you do need to factor in the cost of a new bezel and glass which are also available on eBay. Generally I have found that old speedos found in spares collections have faults and will need rebuilding sooner rather than later. The cost of a professional rebuild is expensive and home rebuilds are fiddly and time consuming so not worthwhile unless you crave originality. The pattern speedos and tachos are actually very good and much better quality than Smiths in my opinion. I have been using them on my B44, A65 and Norton for several years without issue and for the money it's a no brainer. Regarding the harness cover you can get black braided harness covers with a slit which allows fitting over the existing harness and wires, see This Link. I've had good luck with these braided covers which can be used to renovate old harnesses or when making new ones. The slit allows the cover to be opened up and fitted over existing wires and also helps if new wires need adding. Last edited by gunner; 02/06/19 7:11 pm. For BSA parts, I call British Cycle Supply -- call them up, they ship from Limestone, Maine, parts at your door next day. Last edited by celtrock; 02/07/19 7:58 pm. So my seat was just about as crusty as the bike... didn't even come on the bike but rather sitting on top of a tote with the tank. The pan felt pretty solid though there were signs of rust, a bit of damage but I couldn't really tell until I got that seat cover off. After removing the cover I found the entire lip of the seat pan was pretty corroded. That lip was already pretty thin due to the tabs being punched out to hold the seat cover on. Having that vinyl wrapped around it just seemed to hold in all the moisture which damaged the metal. So I cleaned it up best I could and let it soak overnight in EvapoRust. A gallon doesn't go very far with an object this big, I put it in a giant tote but couldn't really get the pan fully immersed. I spent the evening tilting and sloshing the whole thing around. When I checked it in the morning I was surprised to find that it actually came out pretty well despite it all. Gave it a rinse in hot water, dried it, scraped a bit more rust out and painted it with black brake caliper paint. It's the only thing I had and figured it would work just fine. I didn't like the idea of wrapping new seat upholstery over the sharp, jagged metal of the edge and wracked my brain to figure out what I could do. A friend of mine suggested that Flex Tape stuff... or Gorilla tape. As a guy who plays in a band I hate it anytime anybody mentions Gorilla tape. That stuff shouldn't be put anywhere NEAR musical equipment. It's Gaffer's tape all the time for us. But in this case he was right. Gorilla tape was just what I was looking for. I pulled some off, cut it down the middle and carefully folded it over the edges. The stuff is nice and sticky, thick enough to be protective and I don't have to worry much about it coming off as the upholstery is going to wrap around it anyway. I felt pretty confident pulling that fabric tight over the Gorilla tape. The issue with the original cover being in such rough shape is that the foam in all the exposed areas had turned to a substance that resembled hard, dry brown sugar. I proceeded to cut it off with my wife's cloth scissors and replaced the bits with sections cut from a couch cushion I kept up in the attic in case I ever needed dense foam. Finding a use for this stuff certainly isn't going to help my penchant for hoarding! A bit of spray adhesive held it into place while I fit the cover. I didn't worry too much about making it perfect knowing that the upholstery would hold it all down. So then came the scary part; fitting the new seat cover. After convincing myself that it couldn't turn out worse than it was I commenced positioning and stretching. I did a couple of tabs at a time around the perimeter of the seat and once I got it fairly lined up I pulled like crazy. This was NO easy job. Actually pretty stressful for me. I'm pretty happy with how it came out, I know it isn't perfect but it works for my needs. Seat cover cost something like $45 on eBay, probably could have found a seat for that but I feel better knowing that I got rid of the rotted foam and stopped rust production in the seat pan. As this won't get much weather (if any) I can feel good knowing it will last a while longer. I got new SS bolts and washers to attach the brackets with and next I'll attach it to the bike. That is after I get my shipment of rubber from Maine. Post Office probably couldn't make it up our ice-rink of a driveway so maybe they'll be here tomorrow. Fingers crossed! Right on Aron, the seat looks awesome ! How on Earth does one get those indicator lights out of the shell without destroying them? How does one change the lightbulbs in them? I've a LOT of de-rusting to do and it's difficult with them still in and the wires still attached to the right one (as you look at it from the inside). The other two have wires that detach but not this one! The idiot lights lens holders push out from inside to out, the plastic OD is swollen to grip the bucket shell, to remove the lamps pull the lamp tails they are also a friction fit. . A skoosh of WD 40 or similar will help. Don't take my silence for lack of work, just been too busy to post or even take pictures really. I'm waiting for a batch of parts to come in and so I've been working on tearing apart the handlebar controls and putting the good bits together. It was no easy job. It appears that someone had the '71 owners manual which had the controls switched as one set of these had the wires backwards. Many broken switches and broken inner contact plates. Many cut wires. A lot of grime, dust and corrosion. I used 3 different bits of controls in order to make just one working left-hand control setup. Everything else is broken down into parts now either as backup spare replacement or to pass along to the next fella who needs a brake lever or clutch lever or the like. Here are a couple of pics I took as reference followed by the finished product. I laid the tank on just to get an idea of it all coming together. Note to self; avoid letting the Evaporust onto the red paint. It tends to wash it out. 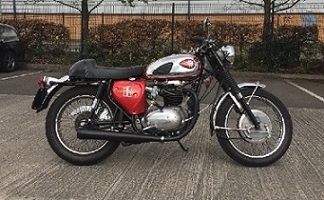 Hang onto the front fender, it may have been an English type with the front number plate mount holes, maybe blank the holes with a strip of SS? If it fits and doesnt rub the tyre be happy, repops can be a lottery for fit. Lookin' good, I like it. Suggestion: take a *very* close look at the frame crossmember that carries the center stand and rear motor mounts -- look for cracks on both ends of the crossmember where it attaches to the frame. Mine was busted clean through, had it welded back in with reinforcements. You know, you had mentioned that before and I neglected to look. Now's as good a time as any with it all empty like that. I went over every bit of the frame with steel wool, WD40 and linseed oil and I don't recall seeing any cracks but at the same time there is a place where the paint has lifted... here's hoping it's not a crack! Ah, so I'm telling the same stories over and over again ... hmmm ... .
Oh, no I would have noticed that. Nope, mine seems solid. Looks like yours may have been dropped straight off the back of a truck! Do you know others this has happened to? There are chrome buttons that you can buy for the unwanted holes in the front fender. I bought some at a chopper shop once. Another time I bought them at an ACE Hardware. In the case of my bike A65L HE 12xxx, July 1971, maybe one of the last bikes built before the summer shutdown, maybe built on a Friday, which is after Thursday pay-day/pub-night per Tridentman, I think it started with crappy welds the day it was built. 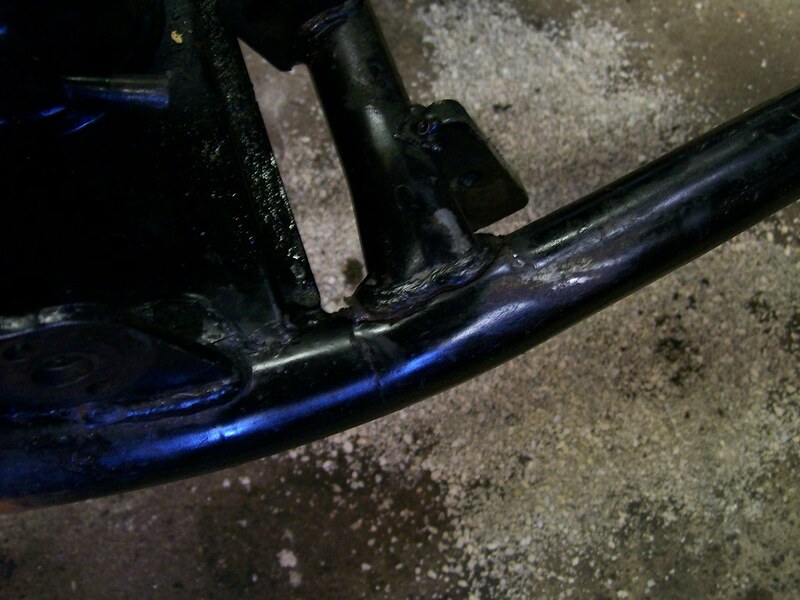 A few other points on the frame look pretty poor, weld-wise. Yes, it happens on these frames. I guess if no new oil has oozed out of your beads after cleaning, you are OK! Waiting for parts to come in so figured I'd get to work on the horn. So I pulled it out of the box of parts... this is NOT the horn that goes with this bike. I have NO idea what bike this even goes to! Touched it to a battery and it doesn't even work. Anybody know what bike this comes from? I have one of those horns, it was on a Commando and also not original. Some no name aftermarket junk (mines dead too).